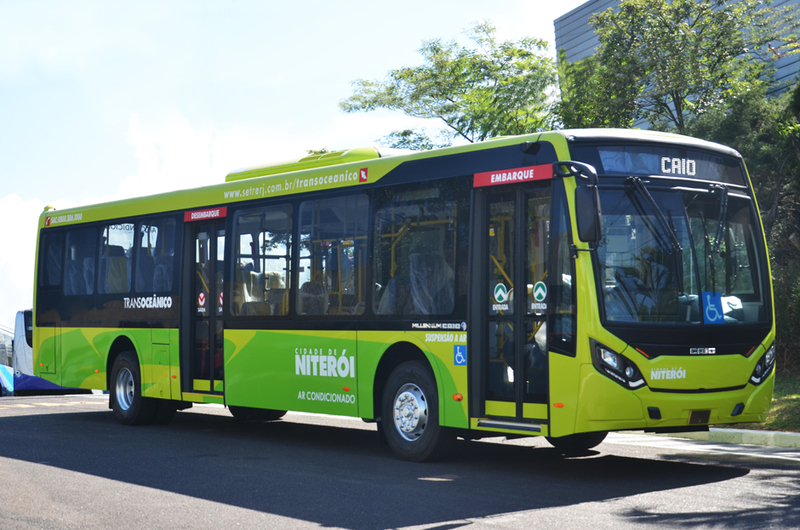 2019-02-11 The city of Niterói is the first in the State of Rio de Janeiro to have 43 units of the Millennium, rear engine, low-floor, with double boarding urban, produced by Caio Induscar, the largest urban bus manufacturer in Brazil. The vehicles were acquired by the companies Viação Pendotiba and Santo Antônio Transportes, which are part of the Consórcio Transoceânico. The 100% fleet of the Caio brand will operate on the BHS (Bus of High Level of Service) highway corridor, which is 9.3 kilometers long and passes through 12 districts of the city`s Região Oceânica. The buses will speed up the transport of more than 123 thousand people. The Millennium, in the low-floor version, has a door on both sides at sidewalk level. The four doors located in the lower part of the vehicle, facilitate the boarding and disembarkation of the passengers. The double boarding allows the buses to operate both on the highway corridor of Transoceânica, as well as on normal roads, where the boarding and disembarkation of passengers happen through the right door of the vehicle. In the exclusive corridor, the passengers will only be able to enter and leave the buses at the stations, using doors on the left of the bus. The vehicles also guarantee total accessibility, allowing safe access for people with special needs, seats for passengers with reduced mobility and the elderly. 13,370 meters long, they have a total capacity of 92 people. All units bring comfort and convenience to passengers, with fully upholstered seats, air conditioning, USB input for mobile device charging and monitors for free broadcast television. They also have a fleet management system and a wireless stop request. Completing 73 years of history, Caio Induscar aligns tradition and product quality, promoting great experiences in mobility.